in Photoworld Asia 2017 held in Glorietta Activity Center. 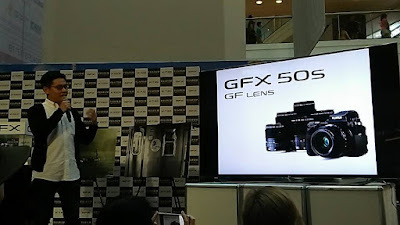 For the piece de resistance, FUJIFILM's latest camera GFX 50S categorized as a medium format mirrorless camera. It adopts the FUJIFILM G format (43.8x32.9mm medium format) sensor and utilizes a whopping 51.4-megapixel. This is industrial and chic, perfect for those who are looking for cameras quipped with a large sized sensor with an even higher number of effective pixels. Driving on image design technology for over 80 years, they've build an unbelievable camera that's got 1.7x the area of full frame sensors. It hastens excellent light reception because of the large area of each pixel and it produces high quality images that could exceed and beat cameras equipped with full size sensors. The movie function on the GFX 50S also supports Full HD recording and people can enjoy high quality shots even with no post-processing done on it. This is the ultimate high-end mirrorless camera made with Magnesium alloy, making it one of the most compact and lightweight devices in this class. It only weights 1.23 kilograms together with the standard lens (GF63mm F2.8 R WR). If you think about it, that's about 60% the weight of a medium format DSLR camera that's equipped with a sensor of the same size. It is also special as it's got a detachable structure, adopted for user convenience. 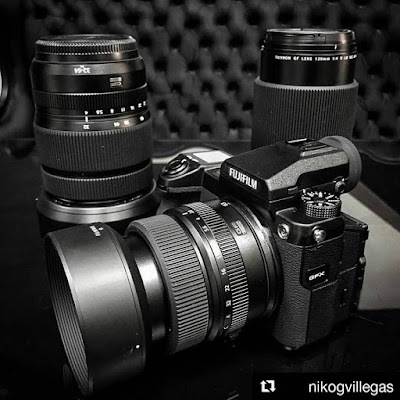 Fujifilm's GFX 50S is indeed the perfect gear for any genre of photography and would be a really great investment for those who are keen to have the best photos, videos and the most advance camera technologies in the world today.